Here in Australia it’s the kangaroos and wallabies that are hopping, also tiny little feathertail possums that are less than 3 inches long but can hop or glide up to 75 feet. They were too fast for photos, but we did get our first wallaby image. 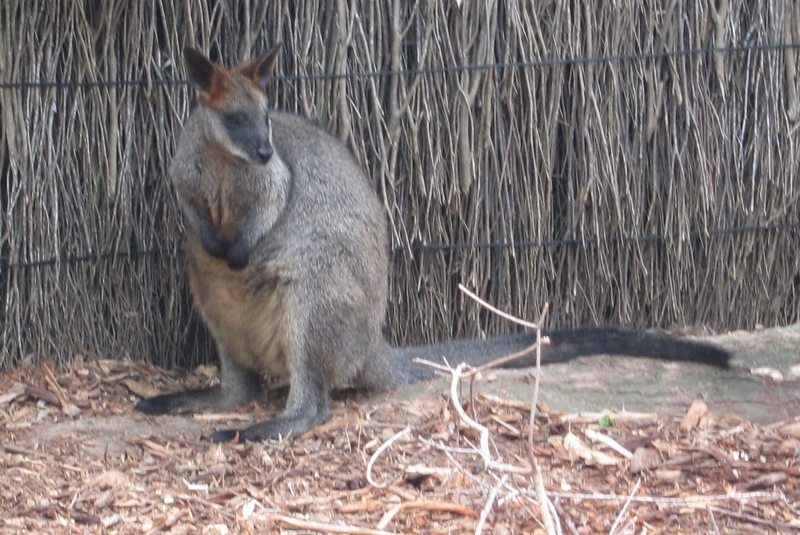 A wallaby, not a kangaroo. They’re both marsupial macropods. The hopping we’re talking about, however, relates to the hops plant rather than any animal. Earlier in our travels, we ran across a huge hops industry in Yakima Washington (75% of U.S. crop, and U.S. is close to being the highest hops producer in the world). By the time we arrived in October, the vines were already down and the hop flowers harvested. They were drying in the oest house before being shipped out to make all that hoppy craft beer that everyone loves. When we arrived in New Zealand in late January, we were in the middle of summer. (It’s the Southern Hemisphere, so everything is upside down, right?) And now we found hops still on the vine, or rather bine, as the growth up the long wire is known. Hops on the 20-foot-tall bine in the western part of New Zealand’s South Island. 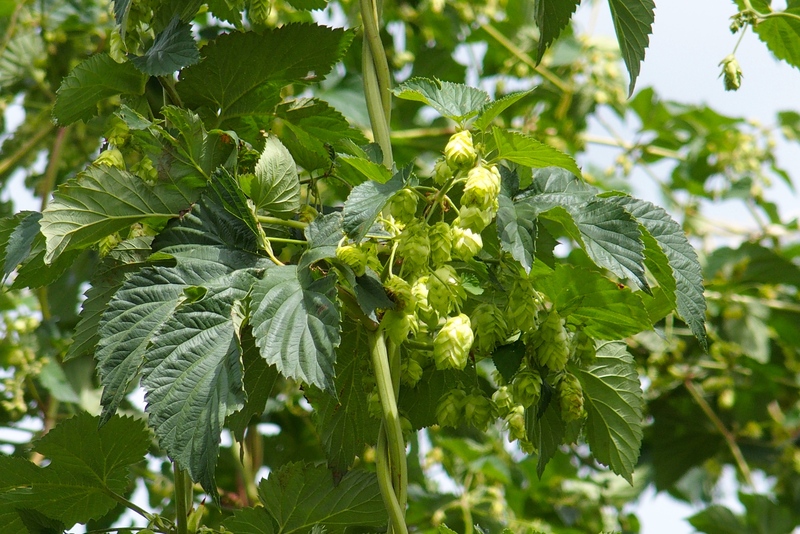 Harvesting hops involves removing the small flowers, the only usable part of the plant. They’re taken to a hop house to dry before being ready for shipment or processing. Only the female plants, which produce these hop flowers, are retained. The flowers or cones are used to give beer the rich (bitter!) hoppy flavor. Modern hops are generally harvested with machines. But it wasn’t always that way. 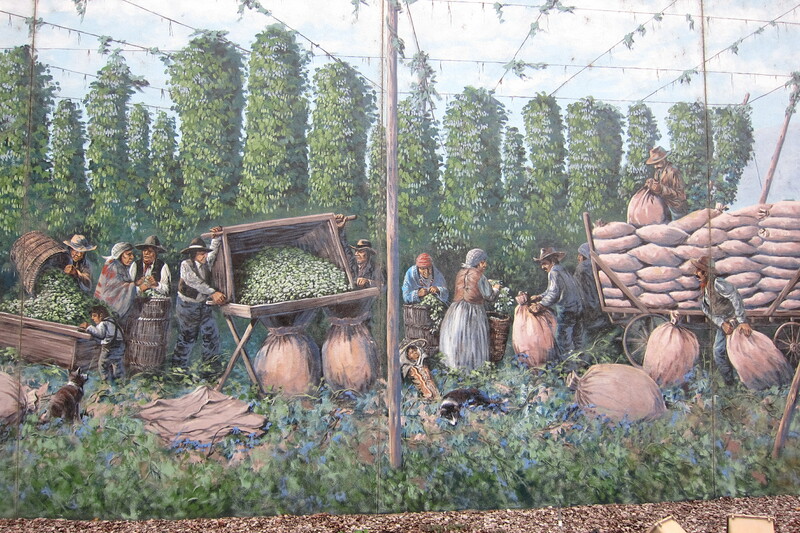 Even though a hops separator was invented in the early 1900s, hand harvesting continued for many years. In fact, in the 1940s and 1950s, some work was done by men on stilts reaching out at great heights to string the wires to support the bines. How do we know this? Jamie Baker told us so. 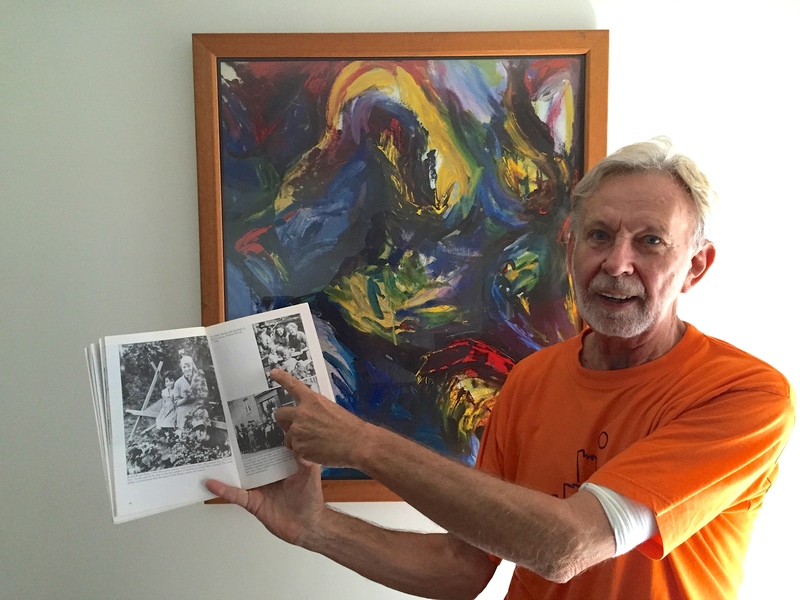 He was in a hopping family in the 1950s. His family lived in London at the time and his mother and siblings made an annual working holiday trip to Kent to harvest hops. Many of his neighbors did the same. This was partly to get out of London, which was very dirty at the time, primarily from burning coal. They also made the trip to earn a little extra money. They often lived in temporary huts and worked the full day in the fields. Then the moms would have to attend to household (huthold?) chores in the evening. 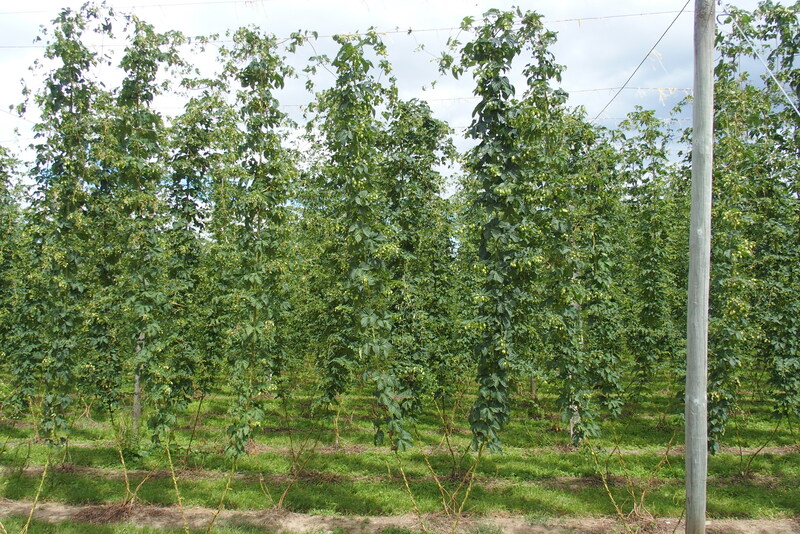 Earnings were based on number of baskets harvested and the baskets were inspected to see that no rocks or other plant material was hidden under the hop cones at the top. Even though the work could be tedious and the days were often hot and long, the families so enjoyed these summer holidays that they returned year after year. It was a great opportunity to socialize and enjoy fresh country air. For kids, it was picking a little and playing a great deal. This is Jamie now. He remembers that the hops earnings often went to new boots. Without the hops, no new boots. So after seeing samples of hops in Washington and around the world in New Zealand, and after tasting lots of the resulting product along the way, we’re in Noosaville, Australia meeting a former Londoner with first-hand hops experience. 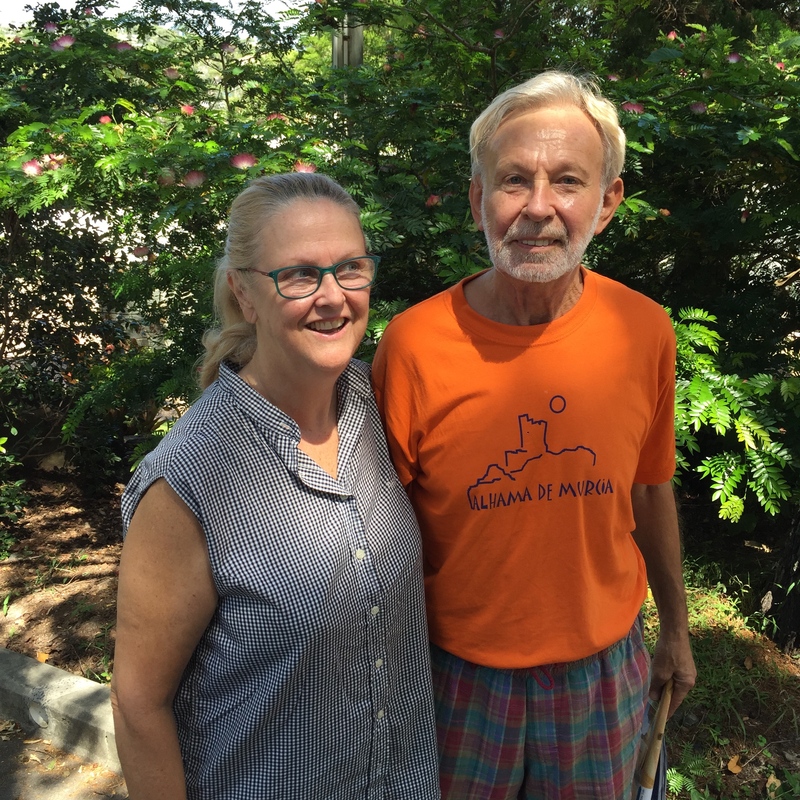 Jamie and Judie were our hosts at a delightful airbnb in Noosaville. We thoroughly enjoyed our time and appreciate their hospitality. Jamie and Judie, with renewed youth and sweetness of spirit. And of course, hopping into their pool was a lovey added bonus. Triathlon training. 94 laps, each one heavenly. As children we all looked forward to going down there, it was a lot of fun. Sure we also picked plenty of hops from the bines, but before lunch and also before dinner (or tea time) it was our job to go and find enough ‘faggots’ (twigs and small branches) to get the fire going in order to cook and boil a large kettle (large old saucepan with lid and hanging type handle.) Our grandfather used to drive us down there in his Standard Vanguard, (he would trade it in for a new one every two years, always the same type of car,) then come to bring us back when the season was over. The two women in that photo with my cousin Ronnie and I, were his youngest sisters, both actually great aunts to me, the one on the left is still alive and still very much in possession of all her faculties at 95 years old. The other was Ron’s mother she passed away in the late sixties of ‘yellow fever’, I never did find out what that was, Ronnie now lives in the SW of France. 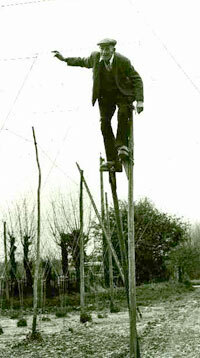 By the way to my knowledge the fellas on stilts never picked the hops from the top, their main job was to firstly attach the cords the top of the frame and get them down at the end of the season, they also used to cover a lot of the bines with netting before the advent of bad weather. This entry was posted in Smell the Roses and tagged Australia, Great Britain, hops, Kent, New Zealand, Toppenish, wallaby, Washington. Bookmark the permalink.